Does anybody know anything about this razor? My dad bought it at least 50 years ago and now I have it. Other than its German made I haven't seen much on it from a basic google search. Its never been used as far as I know. Beautiful razor Mark and wish I could help; perhaps Trinity Shaving or one of our other straight shavers will be familiar. Hi Kevin, yes it is pretty nice and as I said, I don't believe it has ever been used. I'm surprised that it wasn't destroyed by either myself or one of my brothers growing up. There was a nice strop that was seriously damaged by one of my brothers sharpening nails or something (don't ask, at least it wasn't used for target practice). My dad is still pissed about it and its been more than 50 years. Mark, I know nothing about straight razors but that is beautiful. I hope someone comes up with some information about it. Email Brad Maggard from Maggard Razors, if anyone will know about this he will and probably be able to give you a value as well not that you are selling it, but always nice to know. Brad is a plethora of straight razor genius. He could write a book. Thats a beautiful blade. I've never seen anything from this maker before. Looks like it's about 5/8" in width with a hollow grind and a round point. 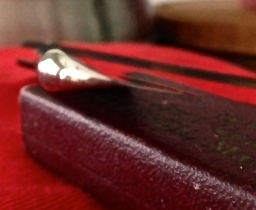 The scales indicate that it was made in Solingen. Is there anything written on the other side of the tang? 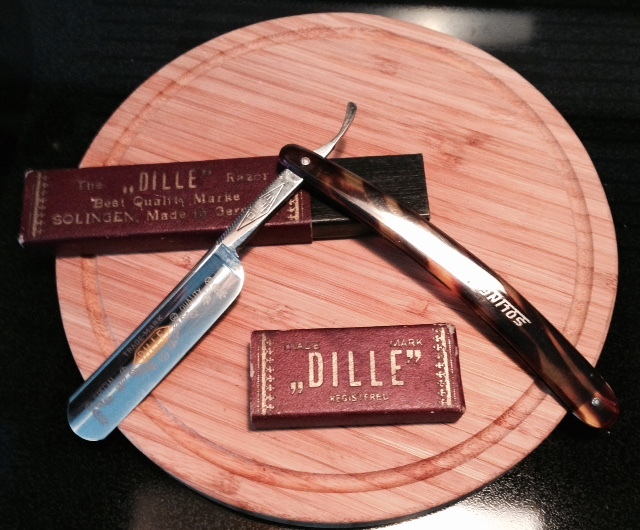 Being a Solingen razor, you can be pretty sure that it's quality steel and it should take a good edge and shave well. Nice looking blade that has probably seen no use. If you're interested in shaving with a straight(assuming you don't already), this would be an ideal blade to start with. However, if you view it as more of a family heirloom, you may want to start with something else to preserve its pristine condition. If it were mine, because of the family history, I'd use it only on special occasions(maybe Fathrrs Day?). Hi Trinity Shaving, thanks for having a look at the razor. I'm certain that it has seen no use so the entire blade is still there as its never been honed/stropped since leaving the factory. 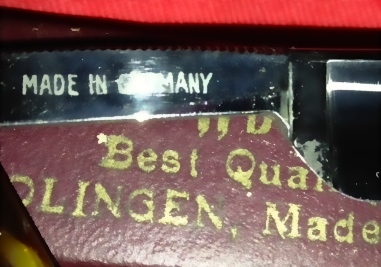 The flip side says "Made in Germany" - I've included some pictures below. I apologize for the quality of the pictures - obviously I'm not SOTD ready I noticed what appears to be corrosion damage on the blade if you look at the lower left corner of the blade - would that be tang end in razor speak? I tried wiping it with some solvent in case it was just guck but it looks like pitting/corrosion. Would you have a suggestion on how to handle that? l'm not a straight razor shaver and likely won't become one at this time so this razor will be part of my museum collection. If it turned out that it was the Rembrandt of razors I would likely sell it to someone who might better appreciate it. I also added a picture of the end on view of the blade, hollow grind. That section of the blade is the heel and the thicker section there is the stabilizer. You may be able to clean that up with hand polishing. 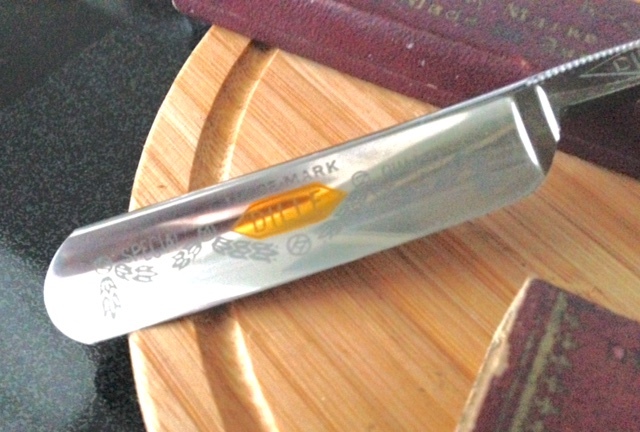 Don't use any polish on the other side of the blade though or it will take the gold off very quickly. If that doesn't work you could try a fiberglass pen. You can find them at auto part stores for a few dollars. After its cleaned up be sure to coat the blade with oil.